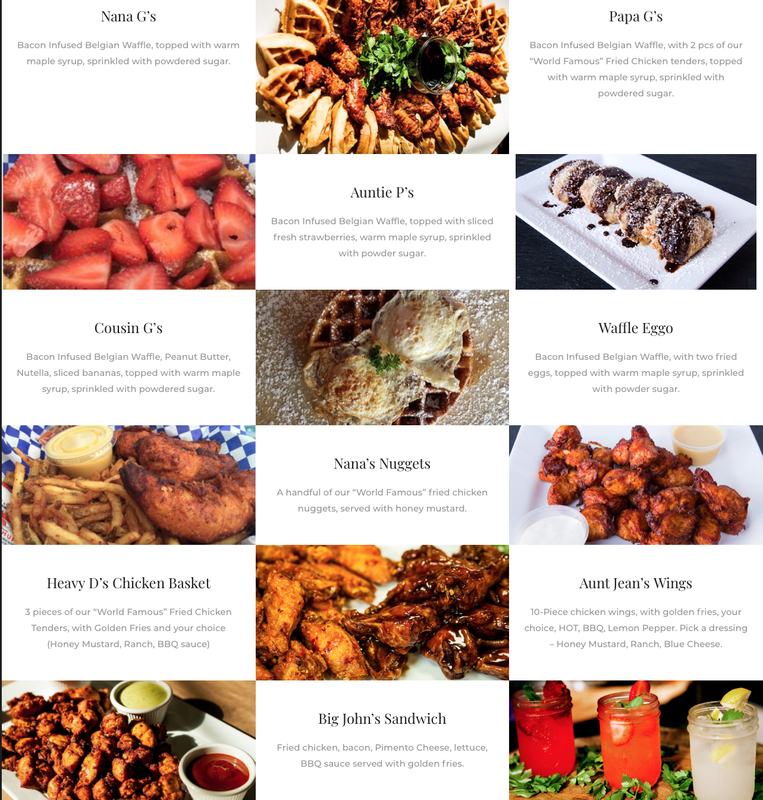 Nana’s grandson had the idea to use her recipes as the foundation of a food truck business over late-night drinks in South Beach a couple years back. They made some upgrades to her recipe with their mom & the truck has been an Atlanta favorite ever since! 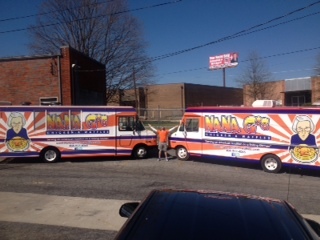 The road to building a successful food truck hasn’t been easy, but with a lot of hard work (& help from the family), we are building Nana G’s into a brand. Look for exciting things to come! Nana G’s is dedicated to providing an outstanding meal where everything is handmade, using the best ingredients available.One bite stirs up the feeling of Grandma’s home cooking! An outstanding dining experience is not measured by food alone. We know that our staff and friendly atmosphere make a guest’s overall experience even that much better. Guest satisfaction is our goal; we want you to have an exceptional experience from the moment you walk in our doors until the moment you leave. Nana G’s is our home, and we want you to feel welcome and comfortable. Our restaurant is cleaned daily, from top to bottom to ensure absolute cleanliness for every one of our guests. Creating a memorable dining experience has been our goal from day one. We are committed to creating an experience that provides an alternative to what dining has become and reminds us of what dining should be. A meal where taste, quality and presentation are the foundation. Delivering this level of quality consistently on a day to day basis is our promise to our customers. Once you have experienced the Nana G’s difference, you too will be a believer. Not only will you taste the difference that using fresh quality products can produce, you will see it from the moment you enter Nana G’s restaurant. NANA G’S – Bacon Infused Belgian Waffle, topped with warm maple syrup, sprinkled with powdered sugar. 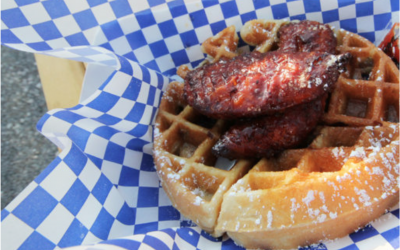 PAPA G’S – Bacon Infused Belgian Waffle, with 2 pcs of our “World Famous” Fried Chicken tenders, topped with warm maple syrup, sprinkled with powdered sugar. AUNTIE P’S – Bacon Infused Belgian Waffle, topped with sliced fresh strawberries, warm maple syrup, sprinkled with powdered sugar. COUSIN G’S– Bacon Infused Belgian Waffle, Peanut Butter, Nutella, sliced bananas, topped with warm maple syrup, sprinkled with powdered sugar. WAFFLE EGGO – Bacon Infused Belgian Waffle, with two fried eggs, topped with warm maple syrup, sprinkled with powdered sugar. 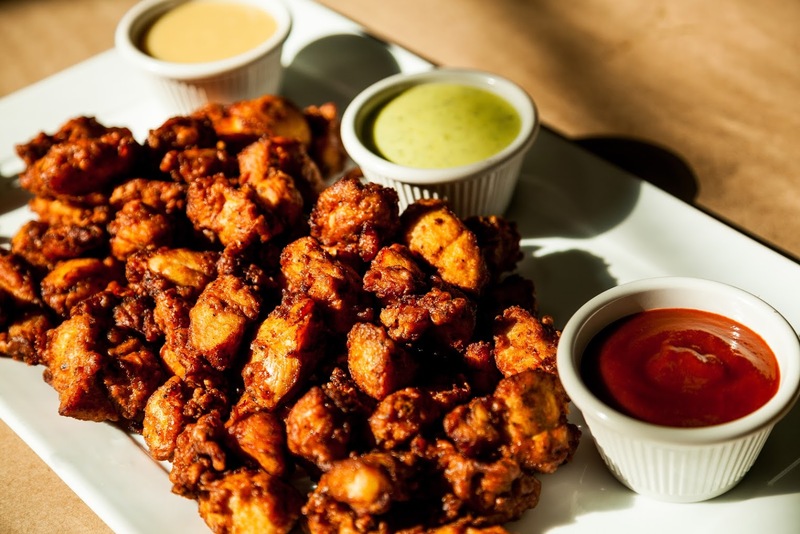 NANA’S NUGGETS – A handful of our “World Famous” fried chicken nuggets, served with honey mustard. AUNT JEANS WINGS– 10-Pc chicken wings, with golden fries, your choice, HOT, BBQ, Lemon Pepper. Pick a dressing – Honey Mustard, Ranch, Blue Cheese. BIG JOHNS SANDWICH – Fried chicken, bacon, Pimento Cheese, lettuce, BBQ sauce with golden fries. STELLA’S SALAD – Chopped Romaine lettuce, sliced fried chicken, bacon, cheddar cheese with fresh sliced strawberries and a choice of Honey Mustard, Blue Cheese or Ranch dressing. UNCLE WILLIES – 2 Fried Chicken Soft Tacos, bacon, cheddar cheese, lettuce, Aioli sauce, with golden fries. Terri’s Chicken Caesar – Romaine lettuce withSliced Fried Chicken, Parmesan cheese, topped with Croutons w/ Caesar dressing. Fred’s Fried Chicken Salad Sandwich – chopped celery, onions and pecans with golden fries. We are always looking for new lunch spots, private events, concerts, weddings and more to cater. To schedule a lunch near you or a private catering event, please fill out the form below! 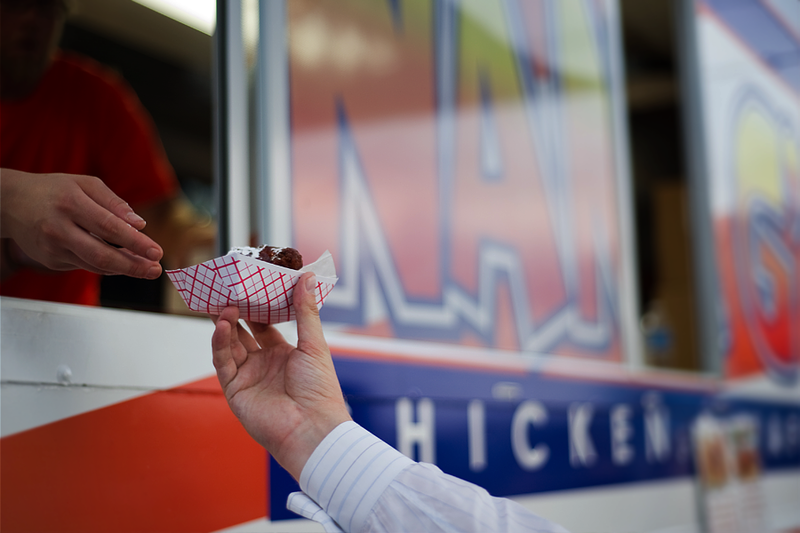 We’ll bring the fun & food right to your office! Contact us, & we’ll arrange to cook up a delicious lunch for you & your coworkers! 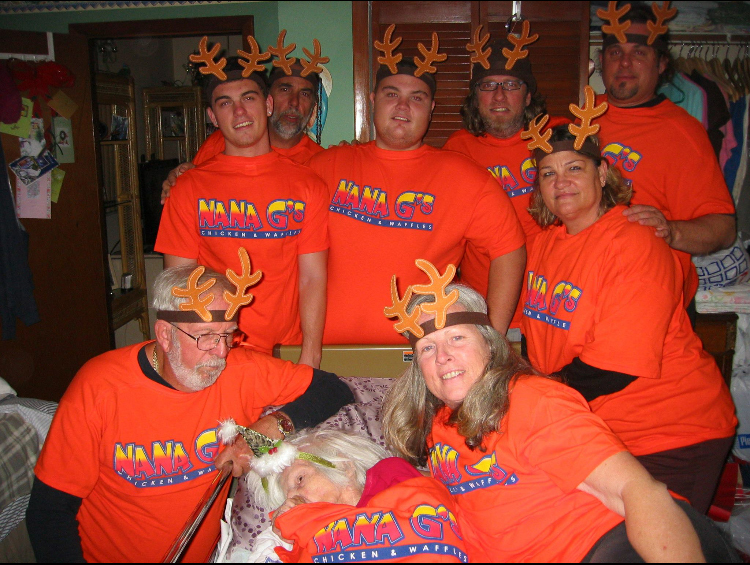 Nana G’s is sure to make your fundraising efforts a success! Nana G’s makes for great tailgating food! Give us a call, & we’ll make your next event a homerun. Atlanta has gone Hollywood, & we’re happy to serve the crews or supplement the craft services spread. We’d love be to part of your special day, rehearsal dinner or rehearsal brunch! 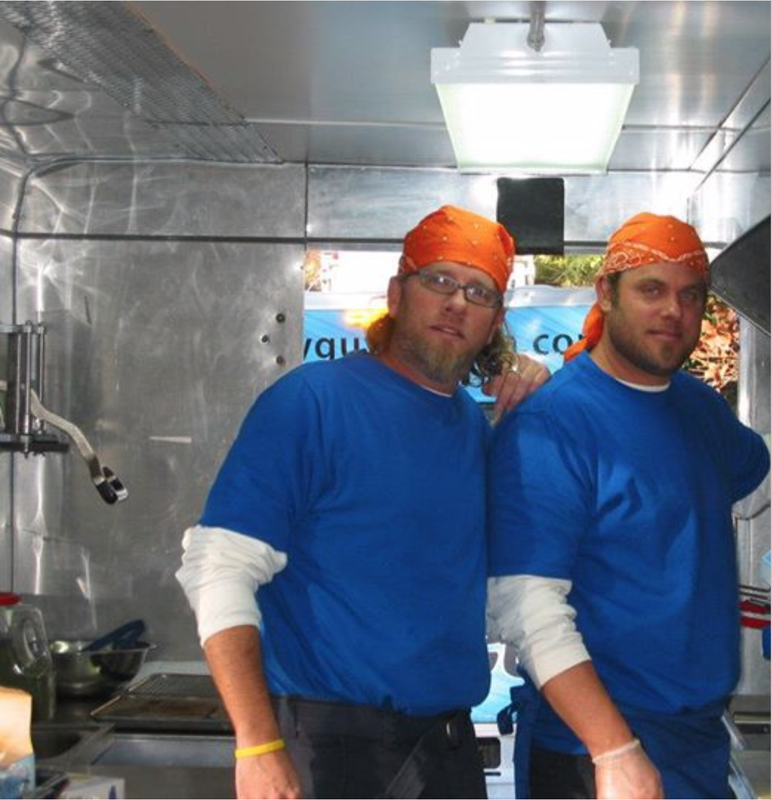 We cater birthday parties, Bar & Bat Mitzvahs, anniversary parties & showers. Contact us, & we’ll make your day memorable! We don’t mean to toot our own horn… So we let everyone else do it for us! Do you think we’d let the Big Came come through Atlanta without letting them get a taste of our world famous chicken and waffles?! 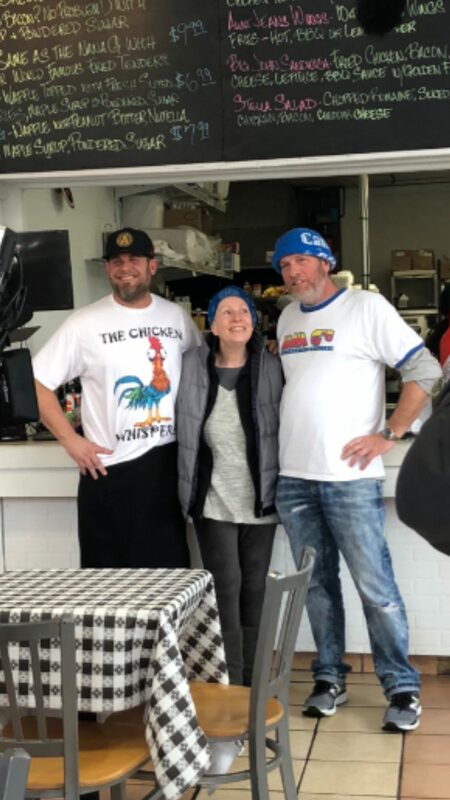 Nana G’s has been getting a lot of attention; and for good reason! Check out ESPN’s clip on our unique and delicious Chicken and Waffles. 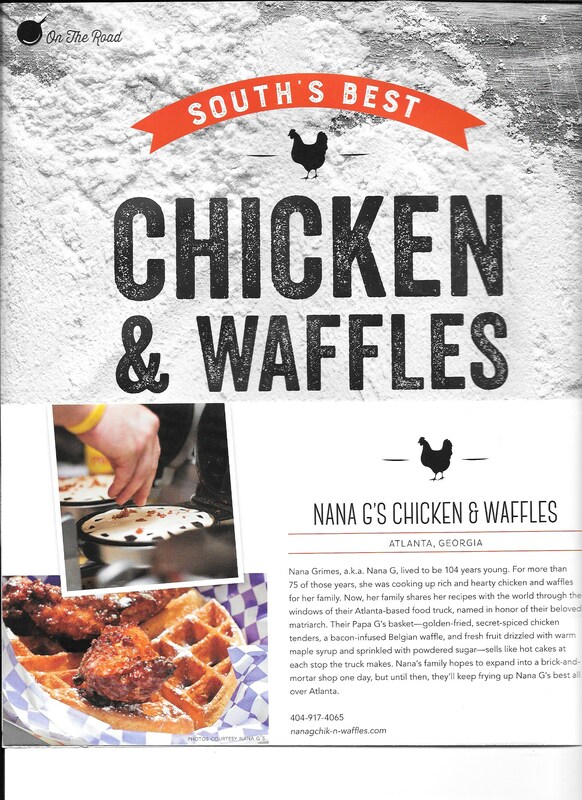 Best Food Truck: Chicken and waffles have been the belle of the ball as of late, and Nana G’s Chicken & Waffles takes it to a whole new level. We’re talking bacon & banana waffles with spiced-up chicken strips. Crazy good! If you are interested in Nana G’s catering your next event or have questions, please feel free to reach out! We will be in touch shortly.